Metal Hurlant Chronicles Kelly Brook (Skarr) Leather Costume is one of its kinds; this entire costume is based on the celebrity layout and so is designed with the best of perfection. This costume has a top corset which is featured with the touch of leather finish and blend of black color and over this it has front area with a diamond shaped neck offering a back collar and has lined stripes as well. 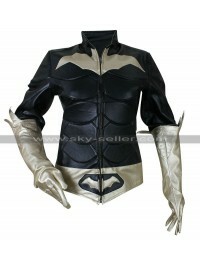 It has full sleeves and edges of the sleeves are provided with the studs to enhance the outlook. Similarly, the pants of this costume are finished with the same black leather material with durable leather and intricate stitching and on the top of it the belt in the loops and the pocket like layout on the knee makes it different and unique from what we get on the other hand. The pants of this costume are finished with the slim fit outlook and always appear appealing and suitable with the corset. The overall look of this costume is not loud at all in fact is a simple and elegant one in all respects. This costume may suit all causal instances and when one feels like dressing up like this celebrity may carry it on the go.